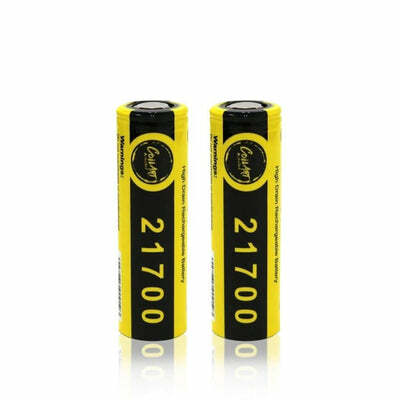 What Is A 21700 Battery? Hi, folks. Today we're talking about lithium-ion batteries. Anyone that uses a mod is probably well acquainted with 18650s, as they’ve long been the standard battery that vaping devices use. But as vaping gets more advanced and manufacturers look for ways to deliver more power and longer runtime, some devices are using bigger battery sizes. Specifically, we're talking about the rise of the 21700 cell, which has been getting a lot of attention from mod manufacturers and is being eyed as the future of vaping. What’s up with them? Are they worth all the hype? We'll get to that, but let's talk terminology for a minute. Lithium cell batteries are named to correspond to their height and width. 18650s are 18mm in diameter and 65mm in height. Early mods sometimes used smaller 18350 cells or bulky 26650s, but for the last few years we’ve settled on an 18650 form factor as the industry standard. 18650 battery cells are the standard vaping battery because they’re relatively slim, compact, and common across a number of industries. You'll find them used in laptop computers, power tools, even in electric cars. Another common use for 18650s are in high-power flashlights (and yes, there's an enthusiast community for that, too). For example, Tesla’s electric cars currently employ about 7,104 18650 cells to store 85 kWh of energy in the Model S sedan. Wow, that’s a lot of batteries! The company has been hard at work upgrading more recent models to include 8,256 cells, which can store more than 100 kWh of energy to extend an electric car's range to over 300 miles. As a sign of the changing times, Tesla has also been experimenting using 21700 batteries. Why would you change up the reliable industry-standard 18650 battery to the 21700 battery? The main reason is space. There are two things that goes into a battery: chemicals storing energy, and space to dissipate heat when that energy is discharged. To fit both power and heat dissipation into a compact package, there's a trade-off: more space dedicated to handling heat means less room for storage and thus lower overall battery life, while more space dedicated to storage means less capacity to handle heat so cells can't deliver as much power without overheating (read: exploding). Most mods with replaceable cells on the market today use either one or two cells, sometimes more, but they're virtually always 18650s. Again, we've got a trade-off: a single-cell device is more compact, but it can't deliver huge power or all-day battery life. A mod with two or more cells can push your vape coil as hard as you'll likely ever want, but it's like lugging a brick around in your pocket. This is where an upgrade to 21700 batteries would vastly improve the performance of vaping devices. If you’re already only using one battery, the tiny increase in size from 18 mm by 65 mm to 21 mm by 70 mm isn’t much compared to the amount of extra perks you get from the 21700s. Still, it's enough to pack as much as 25 percent more runtime than even the most powerful 18650s. This is the crux of the argument for the vaping industry away from the 18650 battery to the 21700. As vapers shift toward smaller mods, companies are in need of a way to make those devices mods more user-friendly and improve their runtime. By using one 21700 battery, you’ll get more power and longer run time, which can really help when you’re on the go and can’t get to a charging port. For vaping devices, the 21700s made by Samsung, LG, and Sony are suitable as long as they support a continuous discharge rating of 20 amps or more. There are also some companies that buy from other manufacturers and rewrap the cells - these include brands like IJOY, Imren, and Golisi. While some of these turn out to be quality cells in their own right, there are also battery companies selling cheap castoffs and cells re-wrapped with bogus use specs, so it’s best to buy from a trusted first-run manufacturer rather than a re-wrapper. If at all possible, stick with Samsung, LG, or Sony. Currently there are a plethora of mods that are compatible with 21700s. There’s the iStick Pico by Eleaf, which is relatively small and uses one 21700 offering up to 100W. It only costs about $20 and comes with a 21700 battery included. There are also much larger devices like the Wismec Reuleaux 230W Starter Kit which requires two 21700 batteries, purchased separately. As the landscape for batteries changes, it’s good to keep up on your battery knowledge. For more information, check out the Battery University as a good place to start. There are also hobbyists and battery experts active on the popular vaping forums and reddit subs who offer up a wealth of knowledge and insight. As more experienced vapers upgrade their hardware and realize the benefits of the 21700 form factor, we can only project that these cells will make an even bigger splash in 2019 and beyond.